MOSCOW, April 12. /TASS/. Anders Besseberg, the president of the International Biathlon Union (IBU), has filed a provisional resignation over a recently launched police investigation in regard to senior executives of the world’s governing biathlon body, the IBU announced in its statement on Thursday. 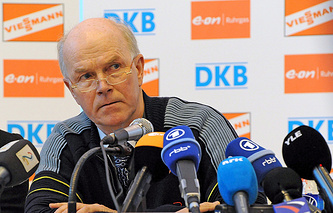 «The IBU President Anders Besseberg has informed the IBU Executive Board that he is stepping down from his position as long as the investigation is ongoing,» the statement reads. The IBU announced on Wednesday that Austrian criminal police conducted searches at the union’s headquarters in Salzburg on April 11 and also questioned President Besseberg and IBU Secretary General Nicole Resch. According to western media reports, the police probes a possible involvement of the IBU officials at the issue in an alleged corruption scheme, which allowed athletes to dodge violations of anti-doping rules violations. «The Secretary General of the International Biathlon Union Nicole Resch is provisionally suspended as long as the investigation is ongoing,» the statement from the IBU said on Thursday. «The IBU Executive Board is taking the matter extremely seriously and continues to be committed to operating under the highest standards of good governance and transparency.».